Mitt Romney’s knowledge of Israel is so impressionistic that contradicting his claims about the kibbutz movement hardly seems worth anyone’s time. I would like to think that a physicist would not feel impelled to post every time a public figure said something stupid about the uncertainty principle. The thing is, what he says about the kibbutz gives us yet more insight into what he thinks about, and how he would run, America. First, of all the kibbutz was a “collective” to be sure, and its founding was influenced by the same Eastern European currents that brought many Jews to socialism; but it was first and foremost a model to create a cultural revolution in Palestine that could not otherwise be brought off: the revival of the Hebrew language in contiguous settlements that did not hire (cheap) Arab labor and thus turn Jewish colonists into Arabic-speaking overseers. 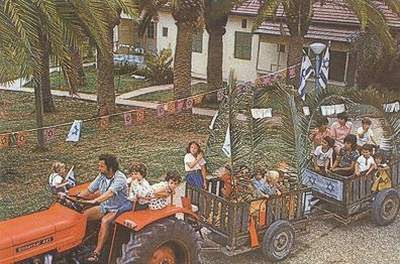 The kibbutz was also a way pioneering Zionists created an economy with virtually no class conflicts like those in the Rothschild settlements established in the 1880s; the British had stipulated that Jewish immigration after 1917 would be limited by the absorptive capacity of the land. The kibbutz made absorption virtually unlimited. And it created a way for people to endure dark and difficult days with a sense of togetherness. The movement as a whole supported the larger Zionist project by appropriating each kibbutz’s surplus. Remind you of anything? Well, Mitt, the kibbutz may not be American but it is awfully reminiscent of the pioneering Mormon settlements of Utah, where even if you ignore husbands taking many wives (on the kibbutz, you just bedded other men’s wives), communitarian ideals were deeply inculcated, hierarchy and missionary zeal were taken for granted, and every family tithed to a corporate whole run by elders who, in turn, invested in stabilizing and proselytizing the larger Mormon project. Of course, Romney doesn’t care about the kibbutz at all. He is trying to make a larger point. America, he says, is about “individuals pursuing their dreams and building successful enterprises which employ others and they become inspired as they see what has happened in the place they work and go off and start their own enterprises.” And here he just moves from ignorance to callousness. You don’t have to be Rosa Luxemburg to know something about the exploitation and impoverishment and insecurity of ordinary working people in the old industrial capitalism, a problem the kibbutz was in its way trying to solve. Everyone from Charles Dickens to Peter Drucker understood that inspiration alone does not buy a worker land or provide him the means to buy industrial machinery. You do have to be born to a rich father to think, `gee, running a business is neat: I’m going to do that.’ Some people without means hit the jackpot or had some great luck. Most were condemned to working for others. The question for them was how to work, at least in part, for themselves-to have a say in how the conditions of work are set, to enjoy that dignity. Now, capitalism and the technologies of industry have changed a great deal since the kibbutz was founded. Virtually every kibbutz in Israel has been privatized. Romney said he liked the start-up culture in Israel. Much of it started up in the 1970s and 1980s, at various kibbutzim, where agricultural production simply wasn’t profitable enough to support the educational aspirations of new generations. In fact, kibbutzim are now mainly corporations run by stock-holders who were once kibbutz members. In microcosm they are a model quite like the system Drucker prophesied, when he wrote about worker pension funds owning much of the stock of major corporations. If that isn’t America, where does Bain Capital think it lives? Perhaps the most cautionary signal is that Romney thought to pick on the kibbutz when he could have picked on a hundred other Fox-News targets. I mean, it is just so obvious that he has Likud apologists writing his stuff for him. The only people who opposed the kibbutz movement from the start were revisionist Zionists, their descendants now in the Likud, who liked to depict kibbutz members a little like the way Ayn Rand liked to depict union leaders. Can we really expect a Romney presidency to view the Middle East this much through lenses ground for him by fellow-travelers? Reposted from Open Zion, a featured section of The Daily Beast, where Bernard Avishai contributes a regular column.